(CNN) - The press secretary for Mississippi Gov. Haley Barbour resigned Monday after Politico reported that Dan Turner wrote internal e-mails poking fun at former Attorney General Janet Reno, and that he made insensitive jokes about the earthquake in Japan. "Gov. 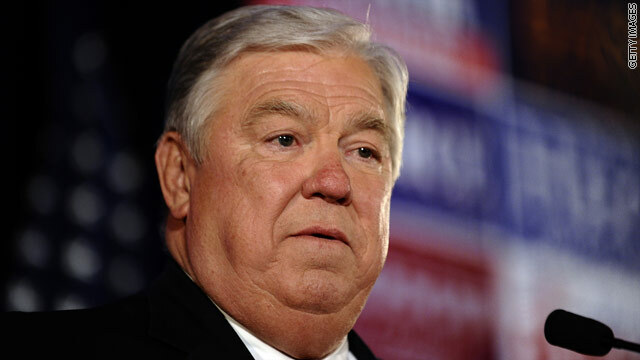 Haley Barbour has accepted Dan Turner's resignation as Press Secretary. Laura Hipp will now serve in that capacity," a statement for the potential 2012 Republican presidential candidate said. The e-mails, which were a compilation of the day's press clippings, historical notes, and apparent jokes, were circulated within and outside of Barbour's official government office and were obtained by Politico. One shows that last Friday, Turner purportedly wrote, "Otis Redding posthumously received a gold record for his single, (Sittin' on) The Dock of the Bay. (Not a big hit in Japan right now.)" In another e-mail, Turner supposedly wrote that when Janet Reno was confirmed to become the first female attorney general, "It took longer to confirm her gender than to confirm her law license." Earlier e-mails also attained by Politico out Turner writing, "1982 – Jamaica issued a Bob Marley commemorative stamp. (Actually, it was a combination stamp and tiny rolling paper.)" In another, Turner made a jab at Cambodian genocide . He wrote, "1998 – Khmer Rouge leaders apologized for the 1970s genocide in Cambodia that claimed 1 million lives. ('Oops. My bad,' hardly seems sincere.)" According to Politico, Turner vouched for Barbour's lack of awareness to the controversial jokes, stating that his boss only receives a printed copy of the clips, not the entire e-mail. Why is it that so many politicians and their assistants find it difficult to act professionally? The Governor should not waste his time, he will not be the nomination. Not suprising! Indicative of the Party (GOP). all these guys are the same. i am sure haley is in on it, and they all think they are very funny. the good old boy network is a culture is an overgrown locker room scene from a bad 1980s teen comedy. by the way – anyone who thinks ANYONE running the state of mississippi could possibly be qualified to run ANYTHING short of a jiffy lube needs their head checked. and i'm from the south so i am just calling it like it is. it's a crappy welfare state. Just another example of the low character and lack of qualification that surround Barbour and all the nut case republicans in their party right now! The party of No is now the party of Nothing and nobody! Gee, what a surprise – another screaming anti-Republican headline. Funny how when Hillary's spokesman resigned, we had no screaming headlines. Funny, but not surprising.